A lot of things can happen during a presentation, worst of which is “death by PowerPoint.” Here are a few mistakes to avoid to make your slides clean. PowerPoint is the go-to presentation software for millions of users around the world. 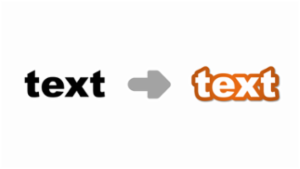 Many presentations use basic text features but you can really make special text jump out of your slide by applying this bubble text design process. This article has lots of tips and tricks to aid your creativity. Many programs have tried to outwit PowerPoint in terms of technology and skill. These programs, however, still lack several characteristics that PowerPoint has possessed from the start. Here's why PowerPoint replacements won't entirely work for designers and businesses alike. When I started this series, I used the term CommandBars because that is the Office Object class that it discusses. Unfortunately, when Microsoft introduced Office 2007, they replaced the standard Commandbar menus with "The Ribbon" and removed the user interface for creating commandbars. This resulted in a common misconception that all CommandBars have been deprecated (eliminated). The truth is that you can no longer create CommandBar MENUS starting with Office 2007. However, you can still create and use pop-up menus, which are sometimes referred to as "right-click" or "shortcut" menus, using VBA. This series is all about these types of menus; I will use these two terms interchangeably in the remainder of this article. Part 1 of this series (Understanding and Using Commandbars) describes techniques for exploring and using the CommandBar object. Part 2 of the series (Creating your Own) provides a more detailed discussion of the CommandBar and CommandBar Control object models, and demonstrates how to create your own shortcut menus. Thanks. This is the first article I've written using the new editor, and I like the flexibility. I was a little disappointed in the ability to size text other than using the couple of "styles". 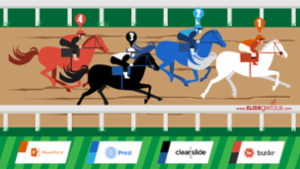 Animations in PowerPoint are a great tool to convey messages when used carefuly with the content of your slides. There are plenty of animation effects and options, including a Repeat feature for individual animation effects. But what if you want to repeat (or loop) a sequence of animations? This can be useful when running unattended kiosk presentations and you want the animations of the slide or a subset of them to repeat automatically. You may think that this isn't possible, but it is, and strangely, by utilising the bookmark feature of audio. 1. The first thing to do is to create a silent audio file. You can do this using Windows recorder or any number of third party sound apps. Simply disconnect or mute your mic before recording the required sound length. In this example, we recorded 10 seconds of silence. You can also download the one we used in this tutorial. This is a seriously genius workaround. Thanks for the really useful tip! Thanks for this excellent idea. When I implemented it, I realized that I only needed one bookmark and could control the speed of the looping with the trim function on the audio element. 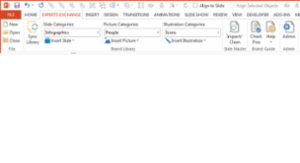 In all recent versions of PowerPoint it is possible to trigger animations. This means the animation takes place when a certain shape is clicked. 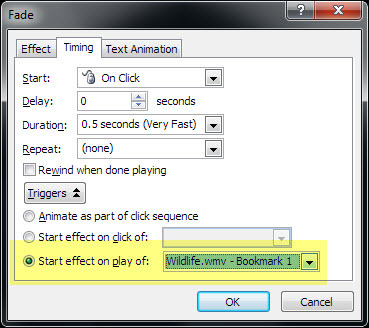 This allows you to run animation “on demand” and outwith the normal sequence of mouse clicks. There is no obvious way to run an animation when a shape is just “moused over” rather than clicked. This is a common feature in web pages but not available in PowerPoint. A typical use might be to show a map or definition when an item is “moused over” and remove it again later. Let’s start by creating a triggered animation. Look at the screen shot. 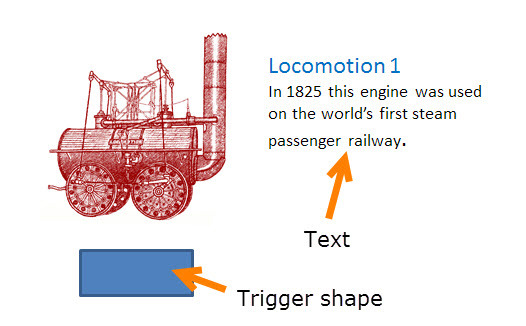 If the text has a fade animation and a fade exit in PowerPoint it will currently appear on the first click and fade away on the second. The desired behaviour is it will fade in on the first click ON THE TRIGGER SHAPE and out again on a second click of the shape. To achieve this open the animation pane. 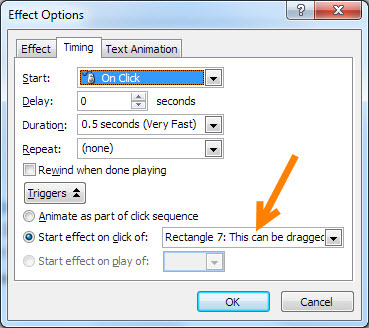 Select both the fade in AND fade out entries (hold down CTRL) and set a trigger of the rectangle from the ribbon as shown. If you have an earlier version of PowerPoint you can use the drop arrow (circled) to choose TIMING and set the trigger here. When you run the slide show ("DEMO1.pptx") you should find that the text fades in when the button is pressed and out again on a second press. So far, so good but how to make this happen on mouseover? I have a request for you. I wanted to create a replica of Gratitude Logo Designed By Vic Bell @ codepen.io (Link for your reference: https://codepen.io/poziomq/pen/YGRdKG). The above script works fine but there is something that I need to accomplish the above said animation. As you know that to create this animation, Body and Head will be 2 different objects and both of the objects can move simultaneously using Down Motion Path. So, I need to trigger the Head on Mouse Hover by applying another Motion Path. I named it "Face" and changed the object name in the script as well. The script works fine then but first it Sends the Face behind the Body object (maybe because of msoSendToBack) but if try to change the script to msoBringToFront, it doesn't work. May I know that what I can change in the script so that the Face object remain on top of all other objects? Secondly, the Body which was following the Down Motion path during Slideshow and when I hover the mouse over the Face for the first time then Body reset it's position and start moving from the beginning along with the Face but then it works fine on the second mouse hover. The Face was also following the Down Motion path and if you hover your mouse over it then it also reset it previous motion path and start moving from the top. Is this could also be possible that the second Down Motion Path applied to Face should only trigger until the Mouse is over the face and stop repeating the second Down Motion path of the face, when you move your mouse away from that object. Is there something that can be done to correct all those problems? Don't know anything about Visual Basic and sorry for asking too many questions. I hope you will not mind that. Attaching the presentation for your reference. PowerPoint is a creative tool in the right hands but it also includes a much underutilised programming dimension. In this beginner level article, we're going to show you some of some key elements of programming PowerPoint using the VBA (Visual Basic for Applications) editor that's included with Microsoft Office. We're going to build a small project that is fairly arbitrary in order to demonstrate several key elements of VBA programming. The project will add a user-defined number of random shapes to a given slide. When you've completed the project, you will be able to create the arbitrary random slide like the one shown below in less than a second! You will need any version of PowerPoint (including Mac) that uses the latest graphics engine and theme design model. This includes 2013 (which we will use), 2010, 2007 and 2011 for the Mac. Your version of PowerPoint must also have the VBA environment enabled (it is installed by default but your IT administrator may have disabled it). Microsoft Word has sophisticated search tools that can search for patterns. 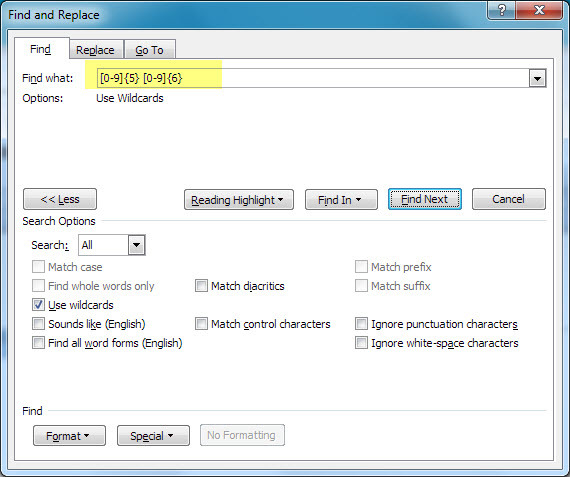 For example if you wanted to search for all UK phone numbers that followed a pattern of five digits, a space and then six digits you can easily do this in Word using Advanced Wild Card searches. The find what box search pattern is any digit 0-9 five times, followed by a space and then any digit 0-9 six times. "Under the hood" Word is utilizing Regular Expressions to search for a pattern. Unfortunately PowerPoint has very basic search tools and a search for a pattern is not available from the UI. You need to format your code. Without indentations, it is difficult to read. I certainly wouldn't want to add it/use it in any VBA project in its current state. From PowerPoint 2010 it is possible to have shapes appear in front of video, in earlier versions video always played in front of other shapes. This means it is possible to have captions animated to appear in front of video. Users who have prepared presentations in earlier version will often attempt to add a delay to the caption animations so that they appear and disappear at the appropriate times. However there is a problem because the maximum delay allowed in 2010 and 2013 is 60 seconds which may not be enough for a longer video. 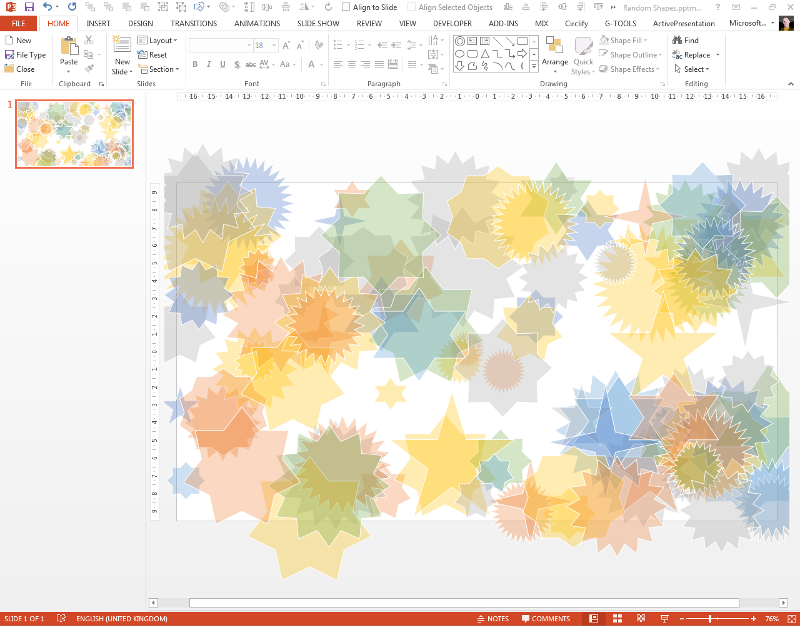 Fortunately PowerPoint 2010 and 2013 added a much better way to time animations. In these versions animation can be triggered from bookmarks in the video itself. After adding your video you can drag the Timeline to the exact spot you would like the first animation to take place. 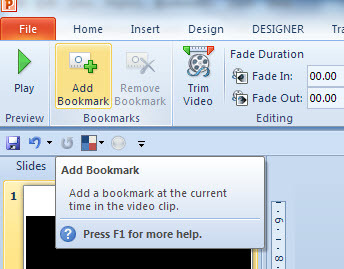 Once you have the exact spot go to Video tools > Playback and click "Add Bookmark". The new bookmark will show as a yellow spot in the video timeline. 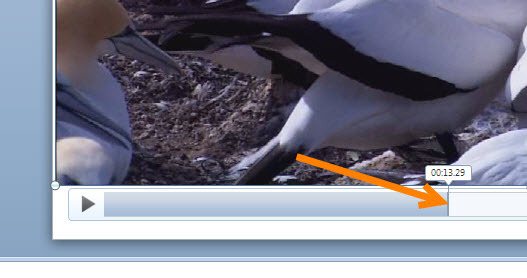 If you carefully hover the mouse over the spot you will see the name which will be "Bookmark1". Repeat this process to add any other bookmarks you need. Add a textbox or shape and type in the caption. Apply an animation (maybe Fade In). Now open the Animation Pane from the Animation tab and double click on the entry for the added animation. Click on the "TIMING" Tab and set the box "Start effect on play of:" to the Bookmark required. Certain code in VBA requires initialization, such as application events. The app initialization is often triggered by the Auto_Open sub which is a special procedure that runs when an add-in loads. More significantly, this sub does not trigger if the VBA is loaded inside a PowerPoint file such as a .pptm file. So how does one get round this? In this article we'll show you how to create a PowerPoint file, which could be a macro-enabled presentation (.pptm), slideshow (.ppsm) or template (.potm), which contains the necessary VBA code to initialise events based on the ribbon load event in the self-contained XML part of the file. MsgBox "Selection Changed", vbInformation + vbOKOnly, "App Event Class"
Save the presentation as a PPTM file and then close PowerPoint. 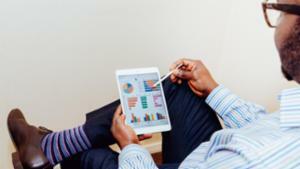 Most folk recognise that Microsoft Excel, being a numbers-and-formulae-centric application attracts programmers due to the natural fit in mindset. 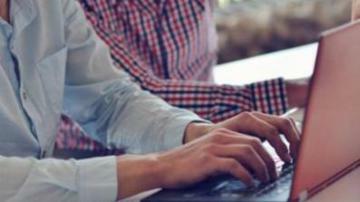 Conversly, when opening Microsoft's dominant presentation creative application, few consider what programming could bring to PowerPoint and even fewer have the skill to combine the freedom offered by visual creativity with the accuracy required of programming. PowerPoint, like all of Microsoft's Office applications comes complete with VBA (Visual Basic for Applications) out-of-the-box. It’s just as relevant here as it is an other Office apps and can bring incredible productivity bonuses for those people and organisations wanting to add automation to the presentation creation and management process. Like Excel, PowerPoint has it’s own object model and the most basic place to start is in response to the question “I want to do ‘something’ to all shapes on all slides within a presentation. I am a VBA programmer in Excel and Access. I did a very large project automating PowerPoint using VBA, and found it a nightmare project. Unlike Excel, the PP object model is very limited. In Excel, you can automate anything since the object model is so robust with workbooks, worksheets, and most importantly, ranges. in PP, trying to find the objects on the slide took great creativity. they couldn't be managed like ranges are in Excel. 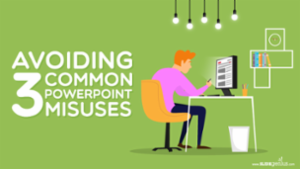 How to find the cause of large Powerpoint files? Have you ever been sent a PowerPoint presentation file and wondered why it filled your mailbox? Or have you ever sent a PowerPoint presentation by email and received complaints about the size? Or have you ever created a PowerPoint presentation and thought twice about sending it by email because it is so large? If so this article is for you and it can be quite simple to find the answers. There's no easy way within any version of PowerPoint to find why a presentation is so large. There are numerous articles on the web with good ideas about how to decrease the file size but they may not help much unless you're focusing on the biggest items. The secret to finding out which are the biggest items in a PowerPoint is to know the format of a PowerPoint pptx file. This type is used by default by Office 2007 and later but can be saved by Office 2000, Office XP, or Office 2003 when a compatibility pack is installed. A pptx file and docx and xlsx and the other Office 2007 types are zip files. I recently received a question about the creation of Computer-Based Training (CBT) that incorporates quizzes in the middle of the lesson. The intent was to keep people engaged in the content, and not to actually track students’ scores. 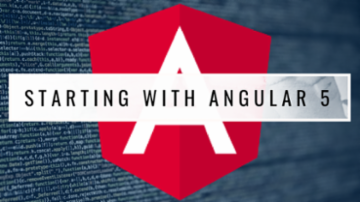 After considering several different software packages, I circled back to one of my guiding principles: How can we achieve this simply and easily with the tools we already have at our disposal? It turns out that MS PowerPoint proves to be a powerful tool in the creation and delivery of simple self-directed learning. This article provides a step-by-step guide to creating a computer-based training presentation that incorporates quizzes. Most courseware authoring software creates materials in one of two formats: self-running executables or interactive Flash/video files. These formats have limitations in many lock-down corporate environments. Executables are not able to run without prior configuration, testing and deployment. Depending on how they are created, I have noted that the Flash files created by courseware authoring tools can become relatively large, with the potential to impact the computer network and storage infrastructure. Flash content that contains streaming video must also be hosted on a media server for distribution. Hey, that's great! Thank you. Very good. I'll incorporate this method into a training presentation. People often ask "How do I make this macro run every time I show a new slide or add a new slide etc." This means making PowerPoint respond to that EVENT and, unlike in Excel, it's not that easy! First, I would avoid using the pseudo events left over from version 97, e.g., Sub OnSlideShowpageChange. Pseudo events are not properly supported in later versions of PowerPoint and so will work erratically. Also, naming your sub Auto_Open will not work in a standard presentation but will in a PPA (version 97-2003) or a PPAM (version 2007/2010) AddIn. B. If the properties window isn't already visible, press F4 or View > Properties window to show it. Use this to rename the class module to something more memorable. We used cNewSlideClass. A. In the normal module create a new sub call Auto_Open. Remember this will only fire in an AddIn and only when the AddIn loads. A. Back in the class module you will see two drop down menus at the top of the page. Change the left one to PPTEVENT; the right, select the event to fire your macro. In our case PresentationNewSlide. B. Between the lines of code auto inserted add the code you want to run. This is a great article JSRWilson. I'd just like to add that if a developer is looking for a cross-platform compatible solution for application events that will work on PC and Mac versions of PowerPoint, there doesn't appear to be one. Why? Lots of ways but you should ask this as a question in the main area. Include exactly what you aare trying to acheive.